It's feels bizarre to be looking at all of these wintry photos while it's still hot as Hades outside. I'm at that point where I'm growing tired of summer (mainly my summer wardrobe) but at the same time know I will be sad to see it go. 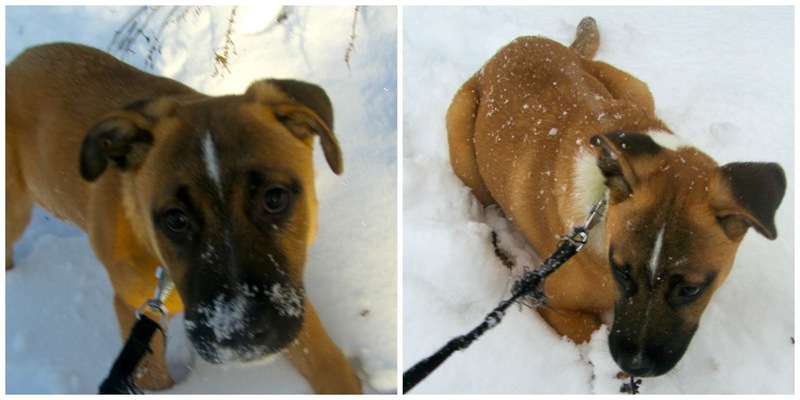 So for now, I'm going to soak up the sunshine and take a walk down icy memory lane with these photos from January 2010. For more Behind the Photos click here. Isn't this photo magical? My first winter in The LPV and I manage to capture something like that. Now I'm pretty sure those round orbs were simply drops of snow hitting my lens, but I like to think of them as twinkling fairies swirling about. Because let's face it... if there is one place in the world that would be inhabited by twinkling fairies, it would be Le Petit Village. Look at my guys! They are so cute I just want to squeeeeeeze them! 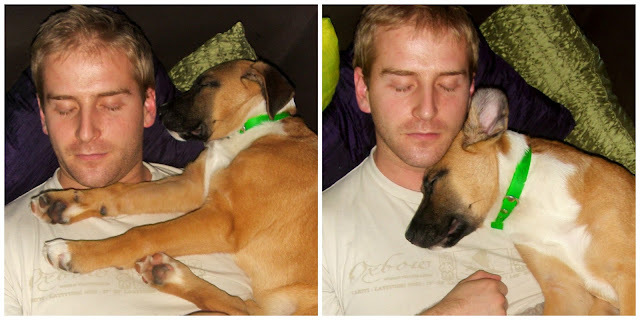 These two photos always give me the warm and fuzzies (it's probably because they can't get into any trouble when they are asleep). Fifty loves the snow! He cannot get enough of frolicking in it's freezing depths. Me, not so much. I am much more content to gaze at the snowy beauty through my window. Of course, I'm the idiot who brought a three month old puppy home in December. Nothing like attempting to housebreak a dog when it's -420394029 degrees outside. Here's us, on our first plane ride together. We were flying to Dublin for my mother's birthday and judging by the bags under our eyes, I'm guessing it was an early morning flight (it was that trip when Gregory tried brushing his teeth with hydrocortisone cream instead of toothpaste). You can learn a lot about a person by traveling together. For instance, I learned that The Husband likes to chat while flying, and he learned that I like to bury my nose in something to read and a bag of Haribo gummies. Consequently, The Husband also learned the joys of talking to himself and that his wife doesn't share her sweets. And as a reward for being brave little girls and trying the sushi, they got to use Gregory as a jungle gym after. I'm not sure who is happier in this photo, them or him. Summer is at the end ... Fifty is so lovely. The first photo is wonderful - looks like a Christmas card scene! I'm so impressed that your nieces tried sushi too. I'm getting a bit bored with my summer wardrobe but I still don't want summer to end yet though! Bon week-end! Those snow pictures make me so happy. I'm over summer. Over it I say! Bring on the cute fall clothes, boots and coats. I know how you feel about your summer wardrobe. I'm beginning to despair! I only own like 3 skirts and no shorts, so I (ad my wardrobe) am definitely ready for winter! You and Gregory are such a beautiful couple - I laughed out loud at his teeth brushing incident though! These pictures are so lovely and I adore getting a little peek "behind the pictures." There's nothing like the end of a season to start me looking forward to a change of clothes - I'm so over ironing linen trousers! OMG the photos of Fifty & Gregory asleep are just so cute!! I loooove all of them! Fifty is the best! And I am exactly the same on a flight. I want to read the whole time and I need some snacks to survive. I hate to talk during a flight so I just ignore everything around. You both have such pretty eyes!! I love that shot of you two! A man who loves dogs AND children. Gregory is a winner. men + dogs. be still, my heart.